With dropping diesel fuel prices, the conversation about compressed natural gas (CNG) has gotten quieter in the industry. But there are still a lot of benefits to CNG trucks that may make sense for your business. Here’s a quick overview on some of the advantages and disadvantages of CNG and diesel fuel trucks. On average, diesel fuel prices were on the decline from October 2014 through February 2016. Since then we’ve seen rising prices, and in November 2017, diesel fuel prices hit the highest price per gallon since January 2015. In addition, New Jersey announced a 31-cent increase in the diesel fuel tax effective January 2017. The bottom line is that diesel fuel prices are constantly fluctuating in response to the geopolitical climate, whereas natural gas fuel prices have been consistently low over the past five years. Use our Natural Gas Calculator to find out how much you could save. CNG engines reduce greenhouse gas (GHG) emissions by up to 20 percent compared to diesel engines. However, diesel engines have made strides in clean technology and fuel efficiency. For example, Freightliner’s Selective Catalytic Reduction (SCR) and BlueTec® Emissions Technology were designed to ensure trucks exceed EPA standards by reducing pollutants, increasing truck performance and improving truck cost efficiency. Cummins Westport’s natural-gas engines feature spark-ignited, cooled EGR combustion technology with a maintenance-free aftertreatment system and a three-way, passive catalyst. This means you don’t need to worry about particulate filters, regenerations or SCR equipment. On average, natural gas engines are up to 10 decibels quieter than a comparable diesel engine. This reduction of truck noise helps to improve productivity by keeping drivers comfortable and neighborhoods quieter. This is ideal for regional haul, utility, construction, refuse, food and beverage, and pickup and delivery. However, if your business is outside of these vocational applications, engine noise may not be as big of an issue for you and your drivers. 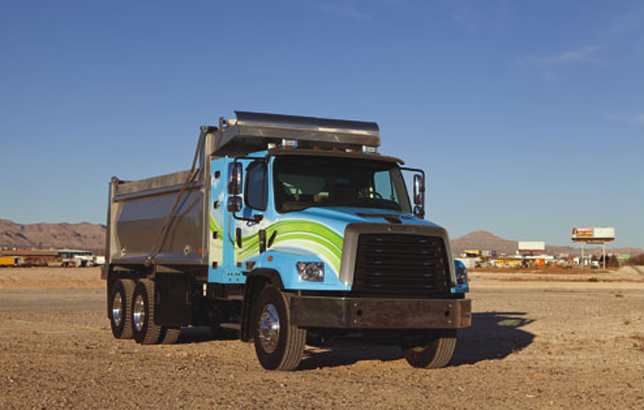 Freightliner offers three natural gas trucks: the Cascadia® Natural Gas, M2 112 Natural Gas, and 114SD Natural Gas. The Cascadia Natural Gas is ideal for bulk haul and regional distribution. The M2 112 Natural Gas has a broader range of vocational applications, including utility, food and beverage, and pickup and delivery. The 114SD Natural Gas truck is a powerhouse for all vocational needs, from snow plow to construction to heavy haul. Learn more about our natural gas trucks and find a dealer to help you decide whether natural gas or diesel gas trucks are best for your business. A Freightliner M2 112 CNG tree trimmer. “Since CNG burns so cleanly, the maintenance intervals for changing the oil or air filters of our Freightliner 114SDs are much longer than in our trucks with diesel engines. Instead of servicing our trucks four or five times a year, we service them only once or twice, and that’s mainly to put on or take off the snow plow equipment when the seasons change.” – Larry Humphries, fleet manager of the village of Downers Grove, Ill.